→Is Automatic Income Even Possible? Is Automatic Income Even Possible? 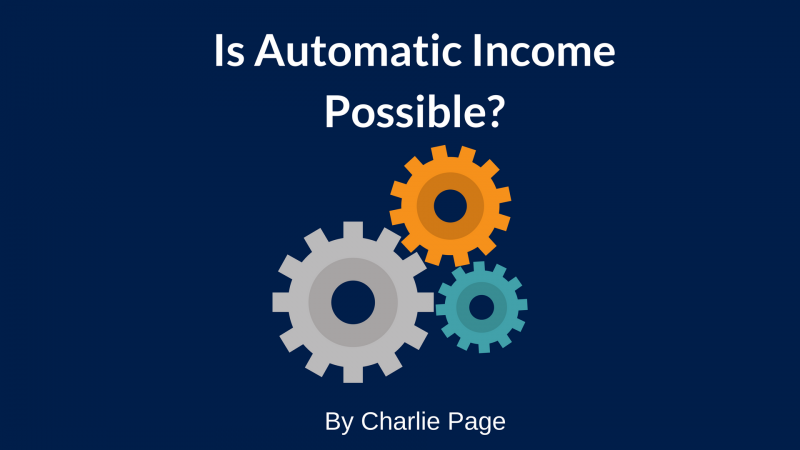 "Is making an automatic income even possible for the average person anymore?" Jack had heard about the "good old days" when you could just put up an offer and convert 20% with the right sales letter. And he'd heard about joining the latest and greatest "just join free and make money" clubs. The problem was ... they didn't work. So what was he to do now? He had been studying Internet Marketing. He knew the lingo - what a squeeze page is and a tripwire offer. But HOW can he put it together into something that will work for HIM? Prefer reading? Here is the enhanced transcript for your convenience. Hi, this is Charlie Page. Thank you for being here. I get this question quite often. Is creating an automatic income online even possible? So many people are so disappointed because they've tried this program, that program, and this other program, and none of them have worked. So, is it really even possible? The answer is yes, but it might look different than you think. It's not about joining somebody's club and just doing what they say. It's about modeling what really works online and creating a real business of your own instead of building someone else's business. There are actually many ways to do this that work very well. Today, I'm going to share with you what I call my "Free Plus" method. Today's video is only one of five ways to use the Free Plus method. Here's the step by step process. Step number one is to find a group of people who want something. This is nothing new, right? We have to find a niche. We have to find a group of people who want something. People call this a group of hungry fish, sometimes. That's okay. That's no problem. I prefer to think of them as people than fish, but that's okay, too. The key is that they're hungry. They need to have a burning desire for change. Not a slight interest in change. Not a "Oh, I might change if I get around to it." They need to want to change, to transform from where they are now to where they want to be and they need to really want it. This is why weight loss, anti-aging, making money online are such popular topics and such strong markets. People need these things. They don't just kinda, sorta want it. They need them. I have articles and videos about niche research to find the right niche on CharliePage.com, so feel free to go there when you finish this video or if you're already on my blog, poke around and you'll find lots of articles and helpful tips about niche research. Step number two, find or create something of high value. The value must be real, not just perceived. You can't take an ebook that you get for free that has PLR content in it and then slap a really fancy cover on it, and have that be considered value. It needs to be real value, not just a fancy cover. Step number three, you give it away for free. Yep, for free. And here's why. You'll sign up 10 to 50 times more people with a free offer than you will even if you charge a dollar. Now, there's a place and time for what's called a tripwire product, where you're charging a dollar, 10 dollars, 7 dollars. This is you're trying to build your list. That's what this is about, and the way you do that is with a high quality free offer. Step number four, you monetize the content that you share. You monetize the information you share. This is where the Free Plus name comes from. The way you monetize it is this. You embed relevant offers inside your free information. If you're sending people to a membership site, you show ads relevant to the content. You don't bombard them. It's not like the Las Vegas Strip. You just place an ad in a strategic location that is relevant to the content that they're consuming right now. Those that want to know more are going to click the ad and buy, and when they do, you'll earn a commission. If you're sending out an email course, you pivot to an offer after every lesson. If you are using a PDF strategy, so you want people to download PDFs every week or a couple of weeks, then your PDFs contain a spot for the ads. I've see many very helpful PDFs that have a spot for ads. If the value of what you're giving away is high, you will never have a complaint about selling. I've never had a complaint when I've done this technique. I've never had a complaint. I've never had a person say, "Oh, I thought this information was supposed to be free, and here you're placing an ad." There are other options for doing this and I'll give you more on that in just a minute. Step number five, recommend the best resources. Don't just populate the content or the information you give out with affiliate links. Anybody can do that. Make specific suggestions and back them up with reasons why you're making that suggestion. Think about all the tools a person might need based on your niche and your area of focus, and recommend the best of the best. Now, if you really want to give this idea power, then here's what you do. If you really want to supercharge your sales, you add meaningful bonuses to the products you recommend. Let's assume you're working as an affiliate, and you're going to recommend autoresponders and you're going to do a review of the top three. Well, give a bonus for each one of those. If anybody buys any of those autoresponders, they get this free report, free series of emails they can put in their autoresponder, or something like that. You'll sell far, far more. There are four other ways to do this Free Plus approach. If you want to know more about them, I'd love to share them with you. Keep an eye out at CharliePage.com. I'll be putting videos up there about all five ways, so you'll have a nice package of videos you can watch anytime you want about the Free Plus method. This is Charlie Page. Thanks for being here. I hope you have a great day. Thanks, Charlie to be always sharing free information. It’s definitely possible to make automatically money, but it takes commitment, time and or money.